As French is the language of love and France is the land of lovers, le Jour de Saint Valentin or Valentine’s Day is an important ‘Fête’ or feast day in France. Three Saint Valentin are listed in the calendar of saints’ days and one, of course, is February 14. The day has been celebrated in one way or another, in France since Roman times, first as the feast of Juno, then as the day (in the middle of February) when animals coupled for spring births. By the Middle Ages, the day had become a day for couples (human, and strictly male and female) In an age where to be single was to be in a precarious, if not dangerous situation, especially for women, le Jour De Saint Valentin became a day for match-making. The tradition of the “loterie d’amour” was born. This involved single people of all ages descending on the houses across the street and calling through windows until they eventually found a match. The man was supposed to become the woman’s champion and protector for the following year and then, hopefully, her husband. But all too often the woman was rejected out of hand. No mention is made of rejected men, so presumably that never happened. The spurned women took their revenge that night by burning the rejecters’ effigies at a public bonfire and hurling abuse at them. The practice got so out of hand (or the men felt so threatened) that before too long, it was banned. A kinder tradition is the one attributed to the Duc D’Orleans. Imprisoned in the Tower of London after the battle of Agincourt in 1514, he wrote love letters, cards and poems for the love of his life, his wife in France. The tradition lives on today as “la Carte D’Amitié” or as we Anglophones call it, the Valentine’s card. The place to be in France, if not the world for Le Jour De Saint Valentin is the little village of St. Valentin in Indre, the central Val de Loire region, which has in 1960s dubbed itself the ‘Village of Love’. 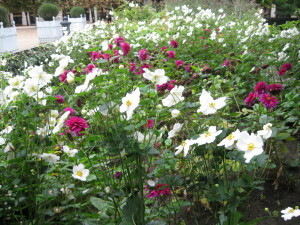 Then in the 1980s the Mayor created a Lovers Garden (Jardin des Amoureux) and inaugurated the annual festival of Saint Valentin. It’s been almost three weeks since Paris was torn apart by the terror attacks in which 127 people were killed and 200 more injured, 99 critically. The Parisians were quick to rally, refusing to be driven off the streets but returning to them the next day to light candles, lay flowers and keep vigil in the places where their fellows had been mown down, standing in solidarity to sing the Marseillaise and declare “Je suis Paris”. It was a photo, taken during World War II. It shows a French matron, impeccably dressed in a coat, hat and gloves with her handbag on her arm. With her head held high, her shoulders back and a look of determination on her face, she makes her way through rubble strewn streets, past a bombed out building. 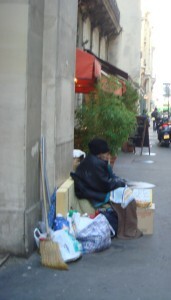 They call it the city of light, but Paris can be a dark and ugly place, especially for the homeless. History, monuments, palaces, chic boutiques, bars, restaurants, gardens with gravelled paths, sculpted trees and hedges, fountains – this is Palais Royal. 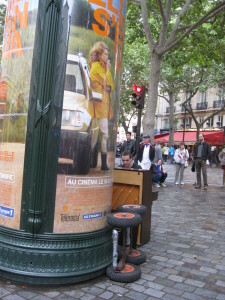 It’s a quaint little quartier, steeped in the ambience of old Paris. 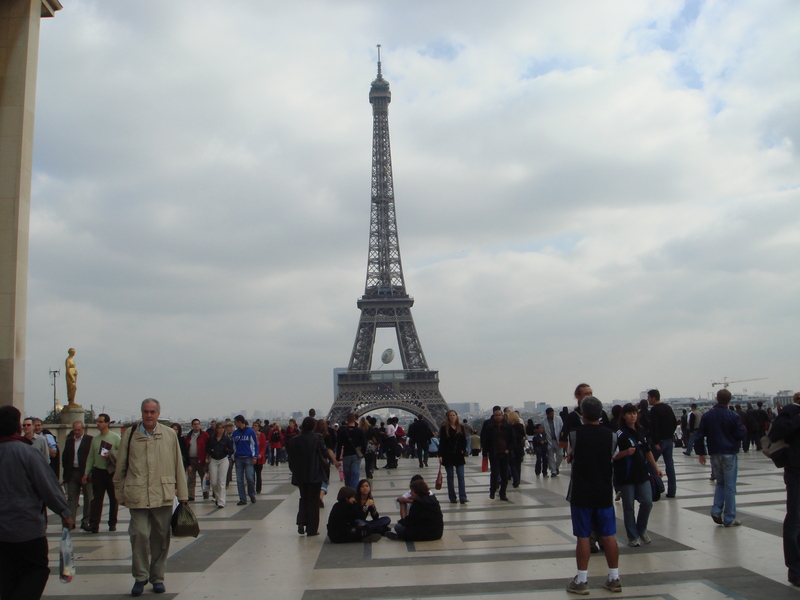 But charm and atmosphere mean little to the SDF or sans domicile fixe (without fixed address, or homeless) of the Premier Arrondissement. An eighteenth century colonnade, an arched passage, a Galerie from the Belle Epoque, is just a place to shelter from the sun and rain, or to sleep under shadow of the night. 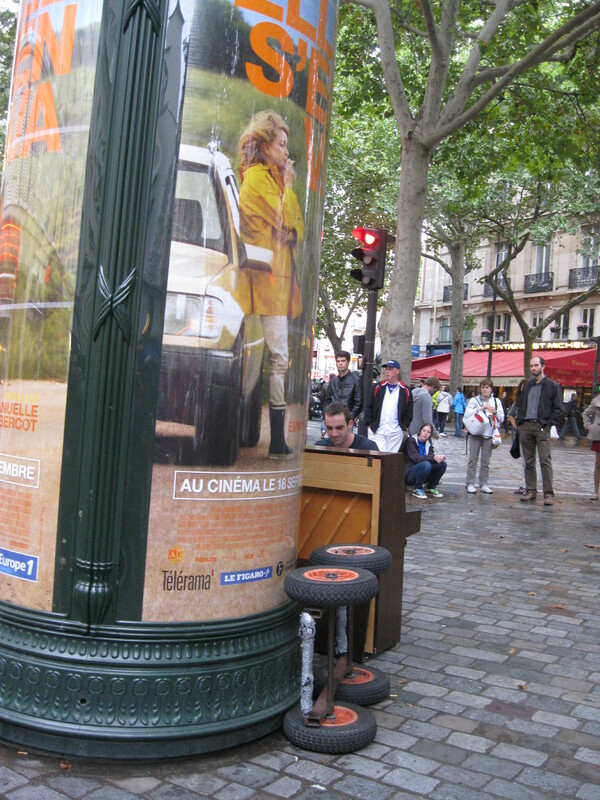 He sits all day on the pavement in front of the colonnades outside Galerie Colbert on Rue des Petits Champs, with his cases packed beside him. People and cars pass, buses stop, but not for him. As I stoop to drop some coins in his little basket, the kind that might sit on any French table filled with bread, his eyes lock on mine accusingly. I can’t look away. He’s talking, pointing, angrily, urgently. I don’t understand his words, they’re rushed, garbled, neither French, nor English, but his story is plain, it’s one of pain, loss, grievance, blame and grief. I tear myself away, feeling useless, sorry, guilty. He shouts after me as I hurry across the road. From a corner table in chic Café Pistache, I watch him, still muttering and gesticulating furiously, spread his grubby bedding against the back wall, under the arch and stack his cases close around him for the night. It’s summer in Paris at present, the nights are warm and the days are long so, although no less miserable the homeless are not quite so vulnerable, at least not to the elements. But in a few months the days will draw in, the nights will lengthen and the plight of the people on the streets of Paris will be desperate. 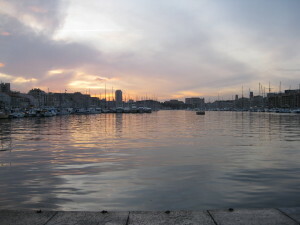 Marseille is a city shaped by the Mediterranean. It sits on the edge of the south of France, in a landscape where stunted trees and scrub cling tenaciously to the rocky windswept hillsides. Marseille’s old buildings are fashioned from the solid pink-tinged stone of much of the south of France. Its modern buildings are shiny glass and steel reflecting the sea and the sky, recalling the shape of waves and the colours of water. Its people are Mediterranean – Africans, Africans and French coloured, moulded and tempered by the sea. 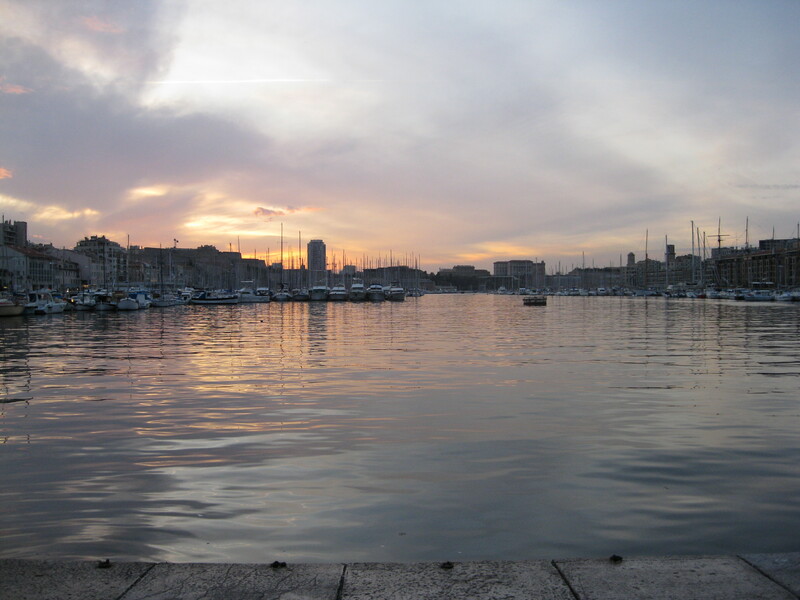 Le vieux port, or the old port, is one of Marseille, most beautiful spots. It also encapsulates the essence of this ancient Mediterranean port. Thick stone ramparts and forts guard it against the wind, the sea and attacks from long forgotten foes. From a distant hill, a walled church and monastery watch over its calm waters, crowded with yachts and pleasure boats. Stores selling shipping supplies, striped seamen’s jerseys, boat shoes and slickers, fishing tackle and souvenirs, line one side of Le Vieux Port. On the other, grand old buildings glow in the sun. Dark, narrow lanes lead away from the water’s edge to sunny open squares edged by apartment buildings with ornate facades and tall shuttered windows. 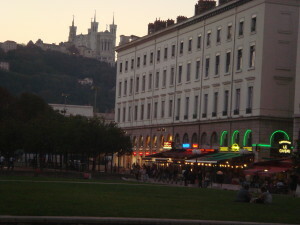 Cafes and restaurants with broad street-side terraces sell bouillabaisse and fruits de la mer. The air is steeped in the smell and feel of the sea. There is, as the Lyonnais say “un embarrass du choix” (an embarrassment of choice) in their fascinating and beautiful city. Whoever you are, Rugbyman, foodie, party animal, nature-lover, shopaholic or film buff and whatever your particular penchant, you’ll find it in Lyon. With over 1,500 hundred restaurants, many of them award-winning establishments with world-renowned chefs, Lyon enjoys a reputation as France’s capital of gastronomy. Most restaurants are located in Rue des Marroniers and Rue Merciere between Bellecour and Terreaux. 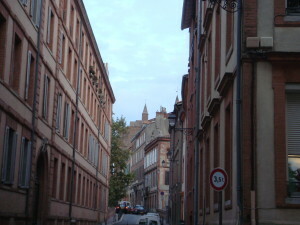 Of particular interest to the visitor, and unique to Lyon, are “Les Bouchons”, the hundred-year-old Brasseries where the atmosphere is relaxed, friendly. and old-world. Here you can sample typical Lyonnais charcuterie as well as machons, the before-work snack once eaten by Canuts, or silk workers and chase it all down with “pots” or special thick-based 46cl bottles of Beaujolais or Côtes du Rhone. Lyon night-life offers many choices. For the party person, there are bars galore around City Hall and Opera. Down on the banks of the Saône, discotheques and pubs pump till dawn. For those with quieter tastes, the night-time streets are perfect for a stroll; they hum with life and people; shadows throw a different cast of beauty on the ornate old buildings; light plays on the rivers; and buskers entertain the passing crowds on every corner. 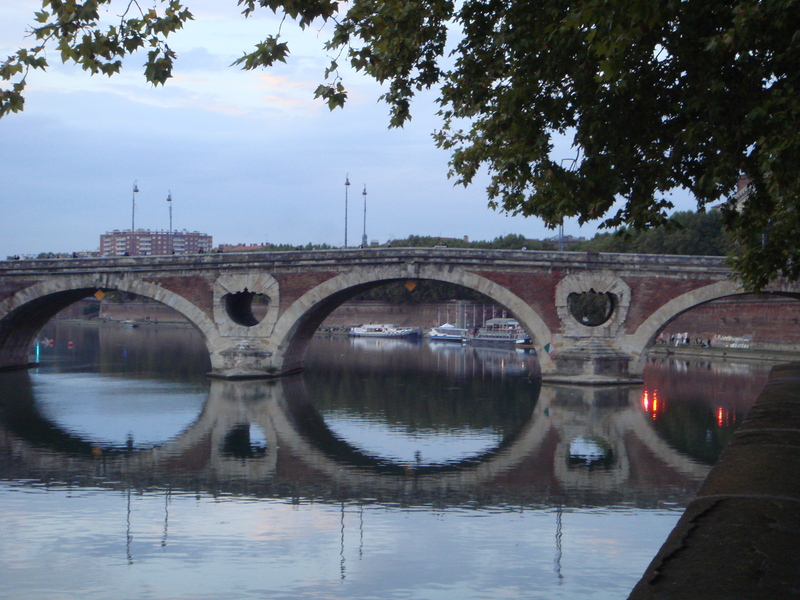 For a daytime promenade and for a glimpse of the Lyonnais at leisure, the left bank of the Rhône is the place to go, especially on warm weekend afternoons. You can walk for five kilometres along the river and enjoy the chain of parks, playgrounds, skate parks and petanque areas which stretch from the Tete d’or Park to Park Gerland; you can laze on a bench on the riverbank and watch roller bladers, cyclists on velo ‘v (the communal bikes provided as part of the public transport system throughout France) and joggers zoom by, while water-skiers and pleasure boats cruise up the river behind you. Shopping in Lyon is a pleasant and easy experience – no long-haul treks across the city, burdened with shopping bags – most well-known stores, such as Galleries Lafayette and Printemps, are located in the Presqu’ile, from the Rue Victor Hugo to the Rue de la Republique. Original designs can be found in the Village des Createurs, in Passage Thiaffait, in the Croix Rousse district. 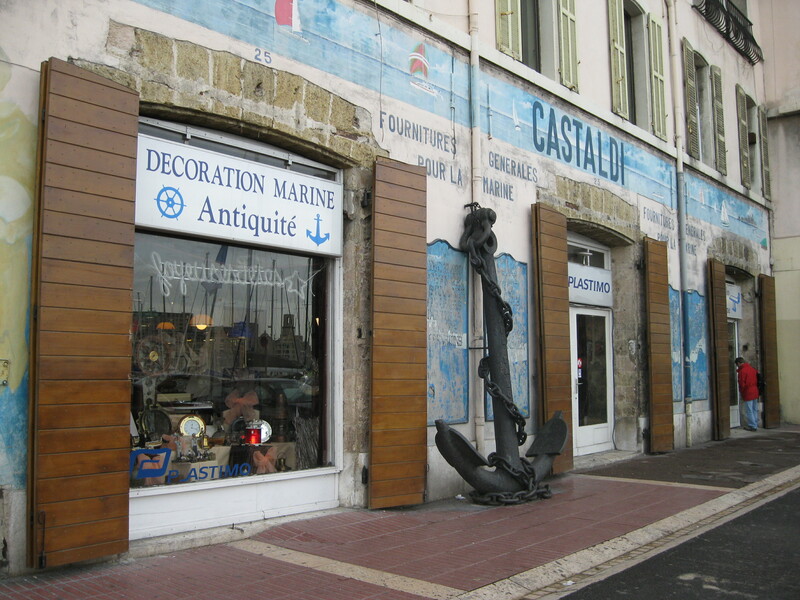 But for a unique retro experience, visit the old world shops of the Passage de l’Argue. In the gastronomic capital of France, a little gourmet shopping is a must and the best place for this is the central food market or Halles de Lyon – Paul Bocuse, in Part-Dieu where 56 traders sell every local delicacy. 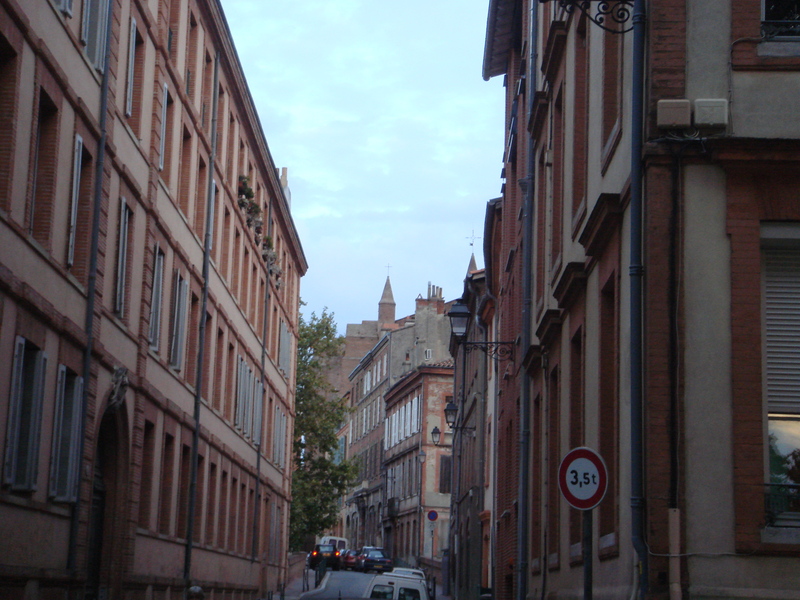 If you don’t see another Lyon Museum, be sure to visit the Musée Lumiere which celebrates the work of brothers Louis and Auguste Lumiere, who invented cinematography right here in Lyon. Its 4 levels and 21 rooms trace the history of cinematography and house such wonders as the “cinematographe numéro un” which was used in the first public movie showing in 1928, a selection of Lumiere films with commentaries and “le photodrama” a kind of giant screen on which in 1901, 360 degree, 6 metre high photographs were projected for public viewing. 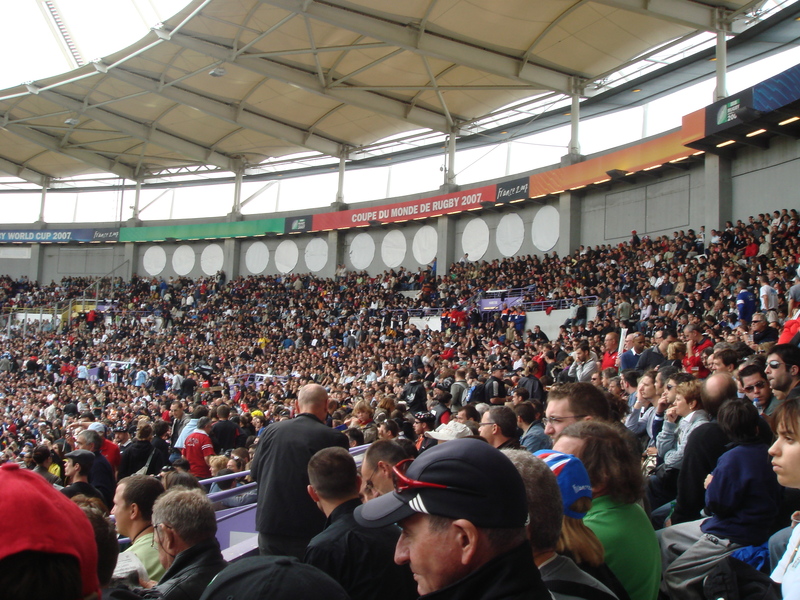 It was the 2007 Rugby World Cup that first brought me to Lyon. I’ll always be grateful that it did, otherwise, I might not have discovered this interesting, beautiful and welcoming city. It was late one evening, in a certain starless Paris hotel. Danny, aged 11, was studying the nightlife below the window, Kat, 15, was confiding in her diary and I was wrestling with 8 year-old Babe’s wet, tangled hair. Suddenly there was a shout from the corridor “Feu! Sortez ! Gardez le sang froid! “Fire! Go out! Keep the blood cold!” Someone translated helpfully through our keyhole. “What blood?” asked the baffled kids. “Later! Quick! Out!” I snapped as a siren began to scream. Muffled foreign music, snatches of unfamiliar language and occasional wafts of exotic cuisine had so far been the only sign of our fellow guests. But here they were now, surging down the corridor like a tsunami. They closed around the kids and swept them away. “Gardez le sang froid” I called as I shouldered my way downstream after them. At the stairwell the crowd slowed, stopped, then swirled impatiently on the spot. A crutch appeared above the sea of heads. “Prenez l’ascenseur. Take the lift” shouted someone. But my voice was drowned out by the howls of protest that accompanied the crutch towards the lift. There was a clang and a whirr. The crutch vanished and the howls grew distant. People poured down the stairs. I hurried along in their wake. With a groan like a dying beast, the lift ground to a halt. Now it hung frozen between floors. Within, a stranded soul in striped PJs slumped dejectedly on his crutches. “Gardez le sang froid” I whispered as his eyes met mine in hopeless silence. Below, two camps had formed. Outside, on the boulevard, Kat, Danny and the men stood at attention, their arms raised in salute at some presence off stage. The ladies and kids had lined up around the lobby. There, half-hidden under a burkha, her head turbaned in a souvenir tea towel from Antibes, was Babe. Given that a fireball could roll down the stairs at any time and that someone was trapped in its path, the mood was convivial. People were passing round biscuits and dates. (I couldn’t help but marvel at the sort of sang froid that could consider refreshments at such a time!) But refreshments were soon eclipsed by a burst of applause from the boulevard. “Napoleon!” yelled a youngster as a figure in a brass-studded tunic and helmet strode into view. “Attention les pompiers! Attention the firemen”, he commanded. Twenty pompiers filed by, dragging a fat hose. Up the stairs they marched. The hose snaked along behind. There was a hopeful cry from the elevator but the pompiers were impervious. Onward and upward they pounded. Doors slammed overhead. Suddenly the hose stopped. Time stood still. There was a long silence. Finally, heavy footsteps crossed the ceiling and clumped down the stairs. The pompiers re-appeared. They were a different detachment now. In ragged twos and threes, with their helmets under their arms, they straggled past. Out on the boulevard, the pompiers had stopped. Danny was trying on a helmet and Kat was giggling coquettishly. I dashed to the rescue. “Gardez le sang froid” called an impertinent pompier as I siezed the kids and marched them away. Back in the lobby, the hose lay abandoned. The ladies, the refreshments and the Antibes tea towel were gone. Babe stood forlornly by the stairs, her hair had dried into dreadlocks. There was a whirr and a whoop from on high and the lift sank slowly into sight. The door clanged open and out shot the prisoner. With two swift strokes of his crutches he swung through the doors and disappeared into the darkness. “What was all that about the blood?” asked Babe as we headed upstairs. Tucked into a narrow valley just outside the mediaeval village of Gordes, is L’Abbaye de Senanque. The thick rows of purple lavender in the foreground, the faded stone walls and slate roof silhouetted against a background of deep blue provençale sky, make the abbey one of the most photogenic and one of the most photographed, buildings in France. 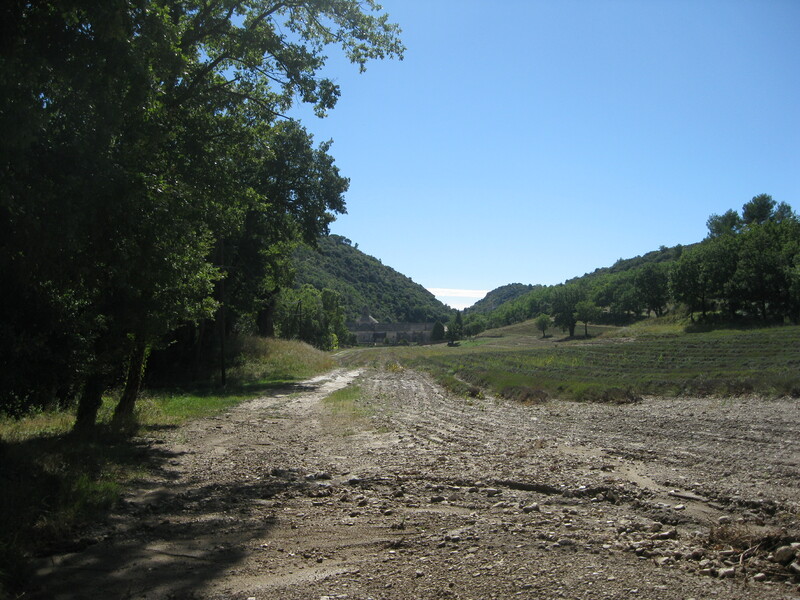 The abbey dates back to 1148, when, under the patronage of the Bishop of Cavaillon, the Count of Barcelona and the Count of Provence, a small group of Cistercian monks from the Ardèche arrived in the valley and established their community in a cluster of rough huts. By 1152, their numbers had outgrown the huts and the monks had gained the support of the wealthy seigneurs, or nobles, of the neighbouring region of Simiane. With the seigneurs’ financial backing, l’Abbaye de Senanque began to take shape, in the Romanesque style of the Cistercian mother house at Citeaux. The church was completed first and consecrated in 1178. Shaped like a cross, with a projecting apse on either side, it points to the north, as the narrow valley did not allow for the traditional eastward orientation. The church was soon followed by the cloister, the dormitory, the chapter house and the calefactory, which, being the only heated room in the complex, the monks used as a scriptorium or writing room. The last addition, in the 17th century, was the refectory. Remarkably, all these buildings survive still, with their simple, austere beauty but still intact. 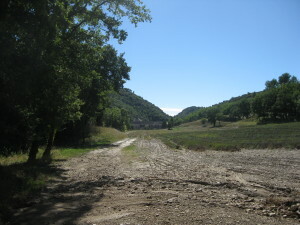 During the 13th and 14th centuries, Sénanque flourished, possessing large estates and operating numerous enterprises, including mills and granges in the region. By 1509, however, Sénanque began to decline; only about a dozen monks remained, then, during the Wars of Religion, Huguenots ransacked the building. With the French Revolution, Sénanque’s estates were nationalised, the last monk was expelled and the abbey was sold to a private individual. In 1854, the Order of the Immaculate Conception bought Sénanque but their community was expelled in 1903. Again, in 1988, another small community returned. They remain there today, running spiritual retreats, making honey and growing lavender as their livelihood. It was autumn when I visited Sénaque, the purple glory of the lavender had been cut to stark grey stalks and the plain, austere abbey had faded into its narrow valley like some ancient stone landmark that had always been there and always would. Les Saintes Maries de la Mer is a quiet, pretty seaside place with small holiday homes and fishermen’s cottages hung with buoys, nets and anchors, with shops selling buckets, spades and plimsoles, a broad esplanade with a painted merry-go-round, a town square dominated by a statue of a Camargue bull and a skyline pierced by the tower of its fortified church. Yet it’s a place with a hint of mystery, none so much as in its name. Les Saintes Maries de la Mer, in English, is, the Holy Marys of the Sea. It’s a name that begs the question – Who were the Holy Marys and how or why did they give their name to this little town out on the far edge of the Camargue? According to the bible, after the crucifixion and burial of Jesus Christ, three women paid a visit to his tomb. They found it open and empty. The three women were Mary Magdalene, the famous follower of Jesus, Mary Salome, the sister of Lazarus whom Jesus had raised from the dead, and Mary Jacobi, the mother of James, the apostle. 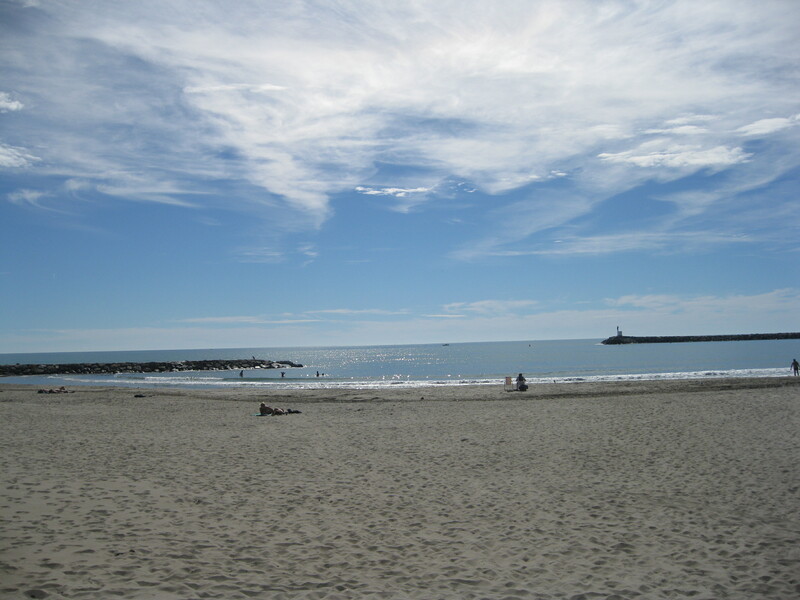 According to an old French legend, back in the very first days AD, three women, their uncle and their dark skinned servant, were washed ashore on the coast near the mouth of the Petit Rhone. They had set sail from Alexandria in Egypt. According to that same old French legend, these three Maries were none other than Marie Magdalene, Marie Salome and Marie Jacobi. Their Uncle was Joseph of Arimathea and their servant was an Egyptian girl named Sarah. They had come to spread the gospel of Jesus and to avoid persecution in their native land. According to the Knights Templar, Dan Brown, and a large number of others, a woman named Marie and her daughter, Sara, were washed ashore on that spot. The woman was none other than Mary Magdalene and her daughter was the child of Jesus. They had fled Jerusalem to escape death. According to Gypsy lore, two women named Marie, half-dead from thirst and starvation, in a boat without oars or rudder, were washed ashore on that spot. They had been put to sea in the Holy land and sent off to starve, dehydrate or drown, a common way of dispatching undesirables (read Christians) at the time. They were rescued by a dark-skinned woman named Sarah. These two Marys were none other than Mary Salome and Mary Jacobi. The dark-skinned woman was Sara, patron saint of the gypsies. The place where the Marys landed was known first as Notre Dame de Ratis (our Lady of the boat) then Sainte Marie (for just one Mary, if so which, or because one Mary stands for all?) Finally, in recognition of the two, or three, Marys and the sea which had delivered them, in 1838, it was named Les Saintes Maries de la Mer. 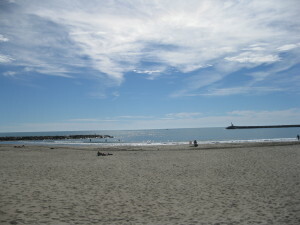 Mary Salome and Mary Jacobi lived out their days in that place at the mouth of Le Petit Rhône. After their deaths, their sacred remains were sealed in a casket and placed in the town’s fortified church. They remain there today. A statue of Saint Sara, clothed in finery, keeps vigil nearby. Pilgrims have been coming to Saint Maries since the 15th century. Arles was on the route of Saint Jacques de Compostelle and as Mary Jacobi was the mother of the apostle James or Saint Jacques, they made the short detour to Les Saintes Maries de La Mer to pay homage to her. Every year, Gypsies from all over Europe gather in Les Saintes Maries de la Mer on May 25, to celebrate the fête, or feast of Saint Sara. Early in the morning a special Mass is celebrated in the church. The casket containing the relics of Marie Salome and Marie Jacobi are lifted from the vault and along with the statue of Saint Sara, it is carried to the sea in a solemn procession. Long into the night, the Gypsies dance and sing. The story of Les Saintes Maries and Sainte Sara, fascinating and mysterious as it is, is just one of the stories of this town. There are many more. 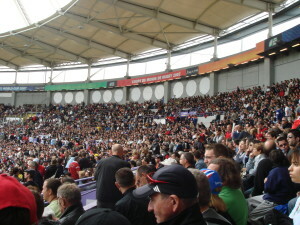 Likewise the Fête of Sainte Sara is just one of the town’s fêtes. There are many more of those too, like La Fête des Vierges (festival of the virgins, in the sense of unmarried girls) started by Frederic Mistral, the great Occitane poet, in 1904.